Manchester United midfielder Paul Pogba has reignited his row with manager Jose Mourinho by defending his leadership style. The Red Devils star lost the vice-captaincy at Old Trafford earlier in the season after a dip in form while taking the armband. 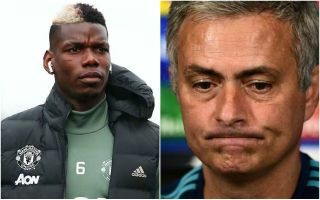 At the time, Marca reported on how Mourinho did not see Pogba as a leader, with some brutal criticisms of the France international’s mentality in that regard. Pogba has, however, had the chance to speak about the issue again during international duty, and made some comments that appeared to be a dig back at his club manager. The 25-year-old insists he doesn’t have to be loud to be a leader, and defended the way he goes about serving that kind of role. ‘I’ve never played in the France team to be captain, being here is already a big thing for me,’ he is quoted in the Daily Mirror. ‘You don’t have to be captain in order to speak, a leader is not someone who has the armband. This ongoing row is far from ideal for United, with the club needing to all pull together after a difficult start to the season. Last weekend’s win over Newcastle will have eased the pressure a little, but MUFC have been far from good enough and are unlikely to climb the table without improving their performances or the overall mood at the club.